Traveling light is a freeing experience. Reduce the clutter, tame the mess, and remove the hassle. 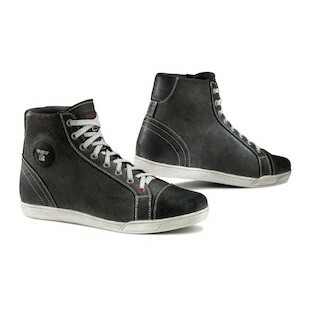 That is why I bought the TCX X-Street WP shoes originally. They are fantastic and have treated me well. However, to be quite honest, they do get a little warm in the summer months, so I am personally very happy to see that TCX has released a new option that is more geared at hot-weather ventilation. The new TCX X-Street Air Shoes are constructed from Air-Tech perforated leather on the upper that will allow your foot to get far more air than the windproof waterproofing of the original. For protection, these shoes are reinforced in the heel and toe counter and also have malleolus protective inserts at the ankle. Basically, they are the same shoe, with the same awesome vintage style, yet they offer a far more comfortable experience in hot or muggy weather. Like I said, I rock the waterproof version of the TCX X-Street myself. Literally… they under my desk right now. They are among the best pairs of motorcycle foot apparel I have ever owned. The only issue that I have is that they do not breathe exceptionally well in hot weather. For riders who do not spend much time on the roads in the rain, the X-Street Air will definitely be the way to go.